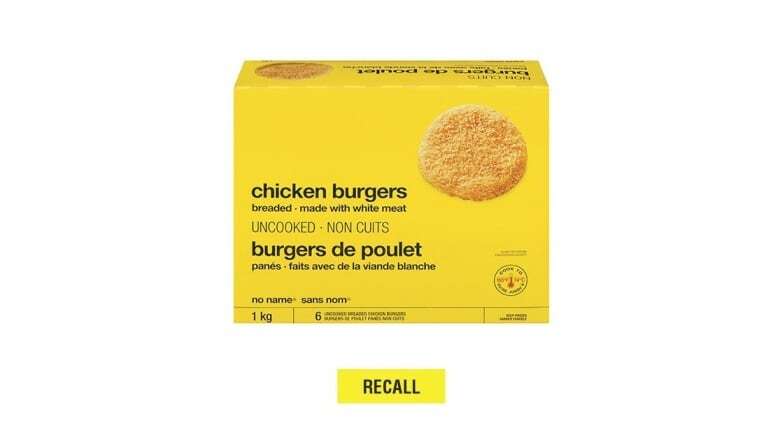 Loblaw Companies Ltd. is recalling certain packages of No Name brand chicken burgers out of what the retailer calls "an abundance of caution." The company says the burgers, which have a best before date of Feb. 6, 2019, may pose a risk of salmonella if they aren't prepared properly. The products were sold across the country at locations under the Loblaws, Maxi, Extra Foods and Independent brands, among others. Loblaw says all affected products have been removed from store shelves, and customers can return them for a full refund. Health Canada says salmonella is the leading cause of bacterial foodborne illness in the country, with more than 200,000 cases in 2015 alone. The agency advises consumers to cook frozen, raw-breaded chicken according to the package instructions, and to the correct internal temperature.